BMW is currently in the midst of a self-proclaimed "model offensive," and I got a close look at the newest member of the salvo, the 2018 X2, which made its world debut at the 2018 North American International Auto Show in Detroit. The X2 becomes the sixth member of BMW's lineup of utility vehicles, with another one (the X7) also on the way. The five-seat X2 fits between the X1 and X3 in price, but it's actually the smallest of the three. Those two look more like traditional SUVs, but the X2 is more in line with the X4 and X6, which have more tapered rooflines and a wagonlike appearance. And in the case of the X2, that shape affects how the rest of the car feels. This is one SUV that is very much going to be limited to city duty. There's some cladding on the sides to make it appear more rugged, but then below that is actually a strip with more body-colored trim pieces that aren't durable at all. The example shown here also comes with the M SportX package, which makes it appear sportier. Viewed in profile, two things stand out: the high beltline and the giant C-pillars, which have an extra BMW logo mounted in the middle of them. Inside, the X2's interior doesn't break any new ground. The front seats are comfortable and the low roofline up front cuts into visibility slightly, but much worse are the sightlines rearward thanks to those wide pillars and slim rear glass. Materials are good throughout except the top of the doors, which are hard plastic. As a member of the "arm out the window" club, that's a sticking point. The backseat was surprisingly roomy. I'm used to having to cram into the rear seat of smaller SUVs (especially ones of this shape), but the X2 had enough legroom and headroom for me to fit without bumping into the seats or the ceiling. However, the space feels much more claustrophobic than expected; the sloping roof means you can't really see out of the front, and the high beltline cuts down sideways visibility, as well. The optional panoramic moonroof doesn't solve the issue, either; it ends about 3 inches too soon to really be effective at allowing light into the cabin for backseat passengers. There are no surprises with the X2. 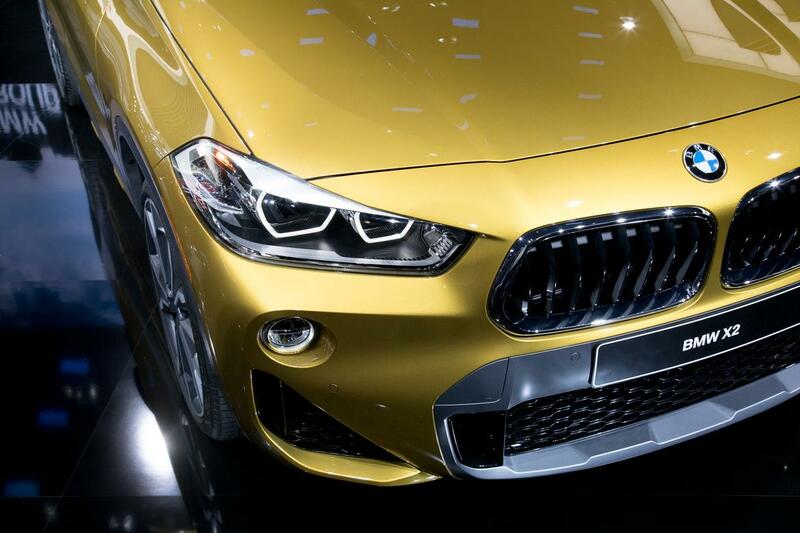 It looks and feels just liked you'd expect from another small BMW SUV. With utility vehicles continuing to sell well, adding another variant to the lineup makes sense — I just wish it was more interesting.